Given Birth When You’re Not In The Hospital – Just In Case! You’re not due yet, but to your horror you are about to give birth, right here, right now. Expecting the unexpected: out-of-hospital birth. Going into panic mode will not help your dilemma. Try to relax and remain calm. What you have learned in pre-natal class will help you through it. It’s great to know that nature has a way to help allow things to progress when the process of childbirth is happening so quickly. If you have someone with you, good for you – at least you’ll have all the help you need. On the other hand, if you are alone, then you have no other choice but to call the emergency for assistance. But tough luck if you are alone on your own and can’t even get help through the other line. This article will be your guide in case you are caught in such a tight spot. Be prepared though for some icky stuff. First of all, take some clean towels for the baby and something for the placenta to fall in, a basin perhaps. The second important step is to find the most comfortable and safe position as much as possible where you can lie down so the baby won’t drop to the floor. So sitting on the toilet is a very bad idea. Remember to apply proper breathing techniques. Here now comes the head of the baby. dont’t push it out in haste, keep in mind to breath gently. As soon as the head is out it will turn to one side. Your next contraction will normally birth the baby’s body, the shoulders will come out next. The body may come out almost instantly if it’s a quick birth. Lest, if you notice that the baby’s body isn’t coming out as it should, help the shoulder one at a time with extra care. First, gently move the baby donwards to relax the shoulder nearest to your stomach. By doing so, the other shoulder will eventually come out. Regardless of the assumption of many people, the baby’s umbilical cord is loose enough to be tied around thebaby’s neck after the baby is finally out. Otherwise, slide the cord over the baby’s head if the cord around the baby’s neck is very tight and hampers the birth of the body. dont’t do anything else to the cord, leave it attached to the baby until medical help arrives. If it breaks, fasten it with a string or any similar object. Tear the membrane open using your fingers when the baby is born if it is not ruptured yet. Newborns are really slippery, therefore be fast and extra careful enough to get hold of the baby with a clean towel. 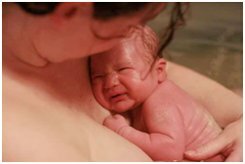 At birth the baby’s normal color is bluish, but should turn pinkish after the baby takes the first few breaths and weeps. If that doesn’t happen, stimulate the body by rubbing with towel. Place the baby chest-down on your chest as it is the best position to give warmth then cover yourselves with a blanket.